BEST BUDS: Find out how Han and Chewie met in this Star Wars prequel. 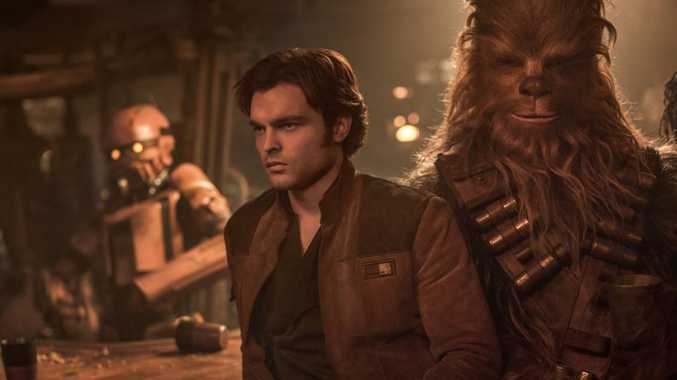 Han: A Star Wars Story tells the origin tale of the franchise's lovable scoundrel Han Solo, originally brought to the big screen by Harrison Ford four decades ago. Alden Ehrenreich brings his own flavour to the iconic role and is joined by Donald Glover, Woody Harrelson and Game of Thrones' Emilia Clarke. It's the only major release this week and will most likely take over the top spot at the box office from Deadpool 2. New Solo trailer: Extended trailer gives best look yet at the latest Star Wars film. Through a series of daring escapades deep within a dark and dangerous criminal underworld, Han Solo meets his mighty future copilot Chewbacca and encounters the notorious gambler Lando Calrissian, in a journey that will set the course of one of the Star Wars saga's most unlikely heroes. Why you should see it: We know what he will go on to achieve, but this Han Solo prequel is bucket loads of fun and steeped in plenty of Star Wars folklore for the fans. Read the review. Deadpool 2 trailer: Marvel blockbuster gets a second outing. Foul-mouthed mutant mercenary Wade Wilson (aka Deadpool) brings together a team of fellow mutant rogues to protect a young boy of supernatural abilities from the brutal, time-traveling mutant Cable. Why you should see it: Rising Kiwi star Julian Dennison is a great addition to this follow-up to Marvel's surprise R-rated box office hit of 2016. Ryan Reynolds is back in top form as the titular, wise-cracking hero in this satisfying sequel. Read the review. Why you should see it: Martin Freeman stars in this outback thriller, which was inspired by Aussie filmmakers' Yolanda Ramke and Ben Howling Tropfest short film of the same name. The film is showing in limited cinemas and will then be available to stream on Netflix in the coming months. Read the review. Life of the Party trailer: Melissa McCarthy and Jackie Weaver star in this back to college comedy. When her husband suddenly dumps her, housewife Deanna turns regret into re-set by going back to college - landing in the same class and school as her daughter. Plunging headlong into the campus experience, Deanna embraces freedom, fun, and frat boys on her own terms. Why you should see it: If you like Melissa McCarthy's brand of slapstick humour then you'll like this back-to-school romp. Plus Aussie Jacki Weaver makes a great cameo as Deanna's mum Sandy. Read the review. Tully trailer: Charlize Theron stars in this honest and witty ode to motherhood. Marlo, a mother of three including a newborn, who is gifted a night nanny by her brother. Hesitant to the extravagance at first, Marlo comes to form a unique bond with the thoughtful, surprising, and sometimes challenging young nanny named Tully. Why you should see it: Director Jason Reitman and writer Diablo Cody prove third time's a charm in this warts-and-all look at motherhood. The chemistry between Charlize Theron and Mackenzie Davis is captivating. Read the review. Crooked House trailer: Agatha Christie classic on the big screen. Why you should see it: Glenn Close and Gillian Anderson shine in this tangled mystery, which faithfully portrays Christie's shocking ending. Chappaquiddick trailer: Australian Jason Clarke stars as Teddy Kennedy in the story that killed his political hopes. Ted Kennedy's life and political career become derailed after he is involved in a fatal 1969 car accident that claims the life of a young campaign strategist, Mary Jo Kopechne. Why you should see it: This lesser-known Kennedy scandal makes for great dramatic mining in this period film examining life in the public eye. Read the review. Breath trailer: Tim Winton's book is now a film starring and directed by Simon Baker. Two teenage boys, hungry for discovery, form an unlikely friendship with a mysterious older adventurer who pushes them to take risks that will have a lasting and profound impact on their lives. Why you should see it: Director and star Simon Baker has managed to capture the essence of Tim Winton's award-winning novel of the same name. He's joined on screen by some exciting young actors in their first-ever roles. Read the review. Avengers Infinity Wars trailer: The first trailer for Marvel blockbuster featuring bad guy Thanos and just about everyone else. Why you should see it: Marvel has taken some big risks with this film in which no superhero is safe as Thanos proves to be a formidable foe. Read the review.